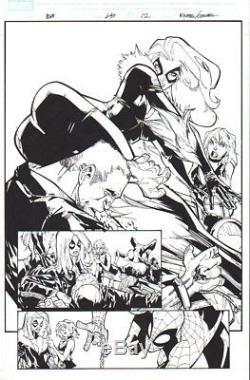 A beautiful splash page of 2010 Spider-Man, Black Cat original art by superstar comic book artist Humberto Ramos! This is the original art to Amazing Spider-Man # 649, page 12 and features Spider-Man, Black Cat, Norah Winter. On this page: While saving Daily Bugle reporter Norah Winter from getting a beating, courtesy of the Goblin gang, Spidey and Black Cat discuss whether or not they are dating! See color scan of published page for more. The art on this splash page was penciled by Humberto Ramos and inked by Carlos Cuevas! PLEASE NOTE: This is an original, hand drawn piece of published Spider-Man, Black Cat art, not a print, copy or facsimile! This 11 X 17 inch splash page of art on bristol board is in excellent condition and would make a great addition to any Spider-Man, Black Cat, Humberto Ramos or Carlos Cuevas collection! It could also make a GREAT GIFT! These charges are the buyers responsibility. And, check out my other auctions for great original comic book art! The item "HUMBERTO RAMOS BLACK CAT, SPIDER-MAN SPLASH ORIGINAL ART-2010! FREE SHIPPING" is in sale since Wednesday, May 16, 2018. This item is in the category "Collectibles\Comics\Original Comic Art\Splash Pages". The seller is "stevo861" and is located in Fort Lauderdale, Florida. This item can be shipped worldwide.